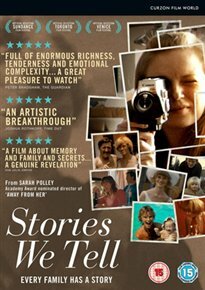 Sarah Polley’s documentary about family secrets – STORIES WE TELL – issued on dvd & Blu Ray. Documentary directed by Sarah Polley which aims to shed some light on her roots and family secrets. Sarah interviews family members and friends while encouraging them to speak of her mother who passed away when Sarah was just a young girl. Growing up, she was teased by her older siblings about whether or not she was the product of a fling her mother may have had while working away from home. While highlighting the unreliability of different accounts of the same story, the film attempts to establish the truth.